Cave tours to the recently-discovered Tu Lan Cave system, 70 kilometers from the Phong Nha - Ke Bang National Park in Quang Binh province, have now been connected to tours to the Tien 1 and Tien 2 Cave systems, discovered in 2014 and 2016, respectively. There are now eleven destinations to visit during tours to Tu Lan Cave, eight in Tan Hoa commune, Minh Hoa district, including Chuot, Hung Ton, Ken, Kim, Song, Uoi, Bi Mat, and Tu Lan Caves, and three in Cao Quang commune, Tuyen Hoa district, including Tien 1 and Tien 2 Caves and Mooc Lake. On a one-day tour travelers can visit Tien 1 Cave and Mooc Lake. The two-day tours take in Tien 1 and Tien 2 Caves and Mooc Lake. Over four days and three nights, travelers can take the expanded tour to the Tu Lan and Tien Caves. Tien Cave, which includes the Tien 1 and Tien 2 Cave systems, is the largest open to tours. 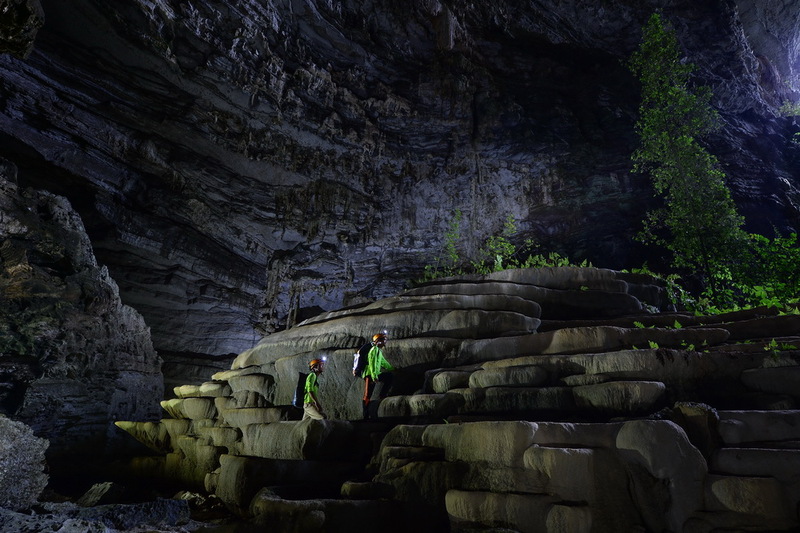 Tien 1 Cave stretches 2 km in length and has two levels connected by a “skylight”, Mr. Nguyen Chau A, Director of tour operator the Oxalis Co., told VET. Because Tien Cave is often flooded during the wet season the ground in the cave is covered by soft sand and there are giant stalactites hanging from above. Stone textures and high vaulted caves, up to 100 meters in height, make Tien Cave unique. The area between Tien 1 and Tien 2 Caves is an old-growth forest with large trees, Mr. Chau A said. The entrance to Tien 2 Cave is quite small (three meters high, 1.5 meters wide), so there is often strong and rather cold wind blowing through. Though the outside temperature may be 38C, people can barely stand for 10 minutes at the entrance due to the strong and cold gusts of wind. When visiting Tu Lan Caves travelers must swim through water. At Tien Cave, however, they can walk through streams. If they choose to, swimming in the lake is possible. Travelers over 15-years-old and in good health can take the tours. “There are two reasons why my company expanded its tours to Tien Cave,” Mr. Chau A said. Firstly, it wants to diversify its tourism products and bring more experiences to travelers. “Secondly, our company wants to create more jobs for local people,” he said. The company has already recruited 25 local people, who are trained before working on tours. As with the other tours Oxalis arranges, adventure tours to Tien Cave must follow very strict rules regarding the conversation of the natural surroundings. “Tourists are only allowed to go along mapped routes and are not allowed to deliberately stray from the group or, for example, touch the stalactites in the caves,” he said. The company has also built environmentally-friendly toilets at each tour stop, he added. “All the detergents are environmentally-friendly and organic waste is mixed with micro organic fertilizer and inorganic rubbish,” he explained. Oxalis not only suspends tours during to the storm season but uses the two-month period each year to support the process of renewing the ecosystems in the caves.